I was tagged to list 10 things about myself yesterday, so here goes. They’re mostly linguistics related, since it’s a hobby of mine. My favorite website is the Online Etymology Dictionary. I read the (other) OED for fun. I don’t have my own copy, but my birthday is coming up! One of my favorite foods is squash (in particular, kabocha). The word squash comes from the Algonquian word askutasquash, which literally means “the green things that may be eaten raw,” from askut – “green, raw” + asquash – “eaten”. (The -ash is a plural affix like in succotash.) It was first recorded in 1643. The verb sleep comes from a Germanic root meaning “to be weak, to sleep”. It might have a connection with the adjective slack. I love salad. The word salad comes from a latin term meaning “salted vegetables”… salt and salad have the same root. The phrase “salad bar” appeared first in 1979. I also love yoga. But I don’t usually go to a studio! I just keep doing podcasts and my own flow. Yoga comes from Hindi and from Sanskrit yoga-s, literally “union, yoking”, from the base *yeug- “to join” (like jugular). I am a Quaker and a Libertarian. (Update 9/28/2017 – I’m not really either of these anymore! Funny how time changes your opinions on things.) How’s that for a puzzle? Puzzle comes from the word pusle which means “bewilder, confound” or also “perplex” (like how nuzzle comes from nose). I used to drive a Honda Civic before I lived in the city. Car comes from a Latin word meaning “two-wheeled Celtic war chariot,” and before that it came from a word meaning “to run”. I sang in Carnegie Hall with my choir when I was 10. Hall comes from a base meaning “to hide, steal”. “Hall of Fame” was first used in 1901 in reference to Columbia College. I am procrastinating from writing the Geometry test that I have to give tomorrow. Geometry comes from words meaning “earth”, “land”, and “measure” = “measurement of earth or land”. Enjoy your Thursday… Gotta go write up a Geometry test now. Almost the weekend! Oh my gosh you were too cute sleeping like that! Congratulations on the A-ha moment and knowing what you want to do AND where you wanna go. That’s way more than half the battle, so you should be SUPER proud of yourself Maggie!!! 🙂 Congrats!! As we chatted about on the phone yesterday, I can tell that you definitely had an “a-ha” moment – hooray!! My favorite word = atrocious. I’m really fond of the word “alliance.” It’s such a smooth, pretty word to say. Good for you for really taking the time to figure out what you want. Very few people are smart enough to know to put in the effort to do that. Keeping my fingers crossed for you on the GREs, not that you would need it! Several things. Thanks for your email. I have some thoughts and will write you back soon. I was pondering your honey dilemma (total bummer – I will miss your oat/avo/honey bowls). Anyway, have you ever tried the anti-candida thing? I have a friend who breaks out whenever she touches sugar, and that way of eating did wonders for her. It’s hard – no sugar, low carb, no vinegar, no grains (‘cept quinoa), etc. However, once she cut everything out for a while, she was able to incorporate certain foods back into her diet. So fun reading your 10 facts. My favorite words are shampoo, toast, and cinnamon…I love saying all of them. I also love sauerkraut. Are you totally jealous of Dainty Pig’s abundance of kabocha in Japan? I am! Hope you finished up the geo. test my adorable little sleeping pumpkin. I’ll email soon. This is a brilliant post. 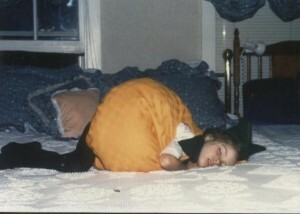 You were such a cute little pumpkin! How exciting about NY for a PhD program! i loved getting to know you further – good for you for taking the GRE and going back to school for something you LOVE. i also love reading the dictionary to find new, fun words…some of my faves include gibberish and mollycoddle. although wanker is prob my fave word of all time – thanks to the British! Your future plans sound so wonderful! Congratulations! Fave word is hard . . . my sister likes “awning,” which I think is a good choice . . . I agree…. you will be BRILLIANT! but I know you will be brilliant at ANYTHING you undertake! back to NY???? I guess me n hubs are gonna have to make a trip there some day… it’s the happenin’ place! I thought the definition for Geometry was TORTURE… guess I am wrong! Happy FRIDAY to you… SHEW we got here! Considering my major is in Rhetoric, this kind of thing totally rocks my socks off. (And, yeah. I read dictionaries for fun too). I always figure that we should try to get a job in whatever our hobbies are. If you love words, then definitely go for something in that field! That’s what I’m working towards. If you go to Midmorning’s webpage on MN public radio, you can see archive episodes with Prof. Lieberman an etymoligist (sp?) at UMN. He has a blog too. It’s great. Whenever we would wake up my brother he was sleeping like that too! SO cute! I would love it if you were in NY for school! Linguistics sounds fascinating. My favorite word is tushie. Good for you, Maggie! I’m sure exciting times are ahead for you. you’re gonna start anew, and I really pray that you find your true passion, and that doors of opportunities will open up for you! Oh, and my favorite word these days just seem to be “freaking”. Oh my freaking God? Good luck with GRE and geometry stuff! I took the GRE about a year ago now, and I can’t believe I just have one semester left of grad school!! How cool that you are a Quaker! I go to a Quaker meeting in my city and really enjoy it! love this maggie, LOL! what a clever and interesting way to present your 10 things. your picture is SO cute. shoutout to Libertarian yogis! i like the word pocket. i just like to say it.